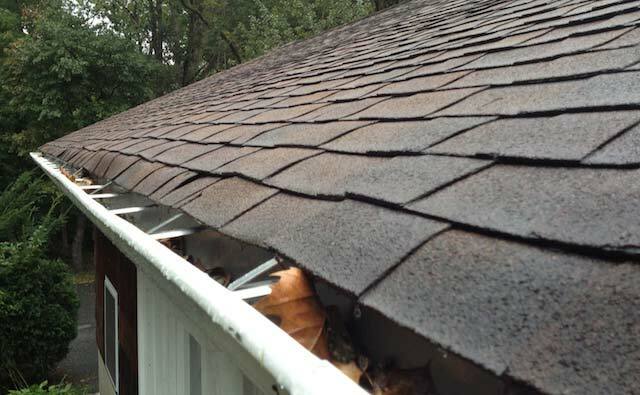 A leaky roof can mean damage to your roofing system, structure, and even your interior. This means it’s important to fix your leak as soon as possible. Here, we explain how to fix a leaky roof. For larger or more difficult jobs, however, we suggest calling our experts. Wait until you have dry weather, then head to your attic with a flashlight. Locate the area where the drip has occurred, then shine your flashlight along the framing members and follow the water mark up. When you see that the water mark has stopped, turn off your flashlight and try to find a hole where daylight shows through. This is where your leak is occurring. If you can’t find your leak with the above method, you can also try a water test. Wait until you have dry weather and invite a friend or neighbor over. Head up to your attic with a flashlight and a bucket and have your neighbor stand outside with a garden hose. Once you reach your attic, have your neighbor turn on the hose and spray your roof, starting at the bottom and working their way up. Look for any signs of water entry and when you locate the leak, place a bucket underneath to catch the water. This is where your leak is occurring. Use a rough brush to clean any dirt and debris out of the crack. Then, use your trowel to spread roof cement into the crack. Make sure you press the cement firmly into the gap and that you spread the cement as wide as your fabric. Unroll your fabric over the roof cement and pat down firmly. Apply another coat of roof cement on top of your fabric and smooth down. Let the cement dry and your roof leak should be fixed. Using a utility knife, cut out the damaged caulk and clean out the area. This means the new caulk will form a sufficient seal. Cut the tip of your caulk tube to be as wide as the gap you’re caulking and place the tube in your caulk gun. As you calk, our roof repair experts suggest holding the gun behind the line of caulk you’re producing and pushing the gun forward. (Keep a small bead of caulk ahead of the gun at all times.) This ensures that you get enough caulk into the gap to form a good seal. Smooth the caulk down with a putty knife.